Cluster Research – Start Your FAN Club! No one lives in a vacuum. We all have people living around us all the time: our family, friends, associates, and neighbors. Known in genealogy as your FAN club. This was true of your ancestors as well. The more you learn about the people who lived with and interacted with your ancestors, the more you will know about your ancestors themselves. We all have FAN clubs in our lives that we interact with on a regular basis. By looking at your ancestors’ family, associates, and neighbors, you can learn a lot about who your ancestors were. FAN clubs help you put your ancestors’ lives in context. FAN clubs are also great for breaking through those tough brick walls where you just can’t seem to find anything, or when you’re finding way too much. They’re also critical for when you’re trying to seperate the identities of two individuals of similar name, age and residence. Another name for this kind of research is cluster research, but FAN club is easier to remember, and cooler, too. After all, who doesn’t want their own personal fan club? Why Use a FAN Club? With our number of ancestors doubling with every generation we go back in time, don’t we already have enough people to research? Why would we want to start looking for a whole lot more people, especially ones who aren’t even related to us? Sometimes the records you are looking for when researching your ancestors are very difficult to find. Sometimes they don’t exist at all. By looking at family, associates, and neighbors, you can often locate records that you would never find otherwise. You may also find vital clues that let you place your ancestors in context, even when no records exist for your ancestors themselves. As an example, let’s assume you were looking for the parent’s names of your 2x Great Grandfather but very few records of him exist, so you’re stuck. When we dig into his FAN club, we might find that his brother served in the Civil War and there is a widow’s pension file for him at the National Archives. In that file, we find a copy of his marriage record, listing the names of his parents. Assuming they were not half-siblings, you’ve just found the names of your 3x Great Grandparents! When you find records on your family members, the best plan is to add them to your research materials, even if they aren’t direct ancestors. But what about associates and neighbors? Your best bet is to create a searchable document to include all your notes. Using an online note-taking app like Evernote is ideal, since you can easily take it on the road with you, wherever you go. I recommend reading this book if you want to learn how to use Evernote specifically for genealogy. I also recommend using a spreadsheet application like Excel or Google Sheets to keep track of your FAN club. What event took place that involved the FAN club member? Where and when the event took place? What role did the FAN club member have in the event? What was the relationship to your ancestor? 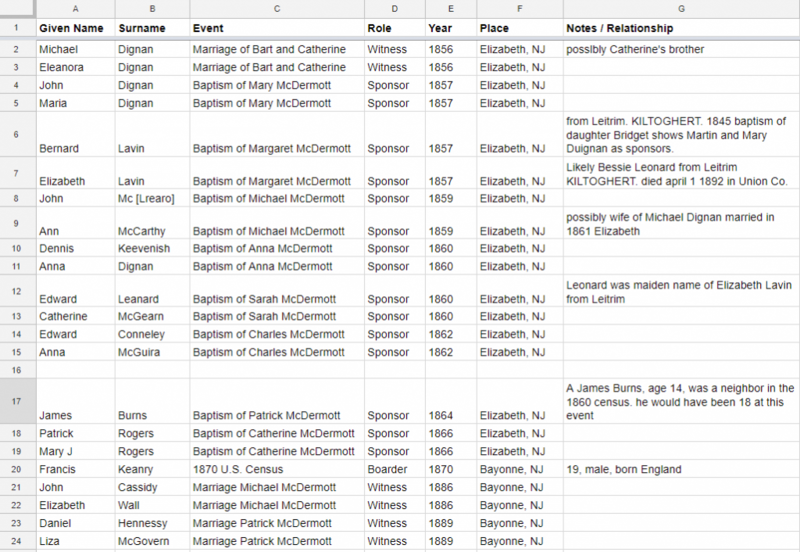 Here’s a simple example of a small FAN club of my ancestors, Bartholomew McDermott and Catherine Dignan (note this doesn’t include any of the neighbors from census reports since that would make the graphic much too large for this post). When you spot a familiar name, you can instantly search to see what else you know about that person and how they fit into your FAN club. There are many ways you can use a FAN club. The one thing in common is they help you solve problem when you just can’t find the direct evidence you’re looking for. There may not be any documents in existence that prove your ancestor’s connection to his or her parents. Either the records were lost, burned, or they just never existed. But suppose you can prove a relationship between your ancestor and someone else, someone who you can trace back further through time. If you can demonstrate that your ancestor is first cousin of someone else, then they must have shared the same grandparents. If you can connect your ancestor to a sibling, they likely have shared the same parents. By taking a step sideways and working through other family members, you can often work around missing evidence. If you’ve started to do any family history research at all, you’ve probably hit at least one brick wall along the way. Sometimes it just seems impossible to find the documents we need to move forward. These brick walls are created by records that are nearly impossible to find, or that no longer exist (if they ever did). FAN clubs are perfect for knocking them down. Your great-great-grandfather emigrated to the United States, but there aren’t any records that say where he came from. What if his brother emigrated to the United States as well? If his brother (or sister, father, mother, or child) filed naturalization papers, they can tell you where he came from; chances are your great-great-grandfather came from the same place. Even documents for a first cousin can help narrow things down. Your great-grandmother’s baptism record says that she is the daughter of Denny Ables, leaving you with no mother’s name and only a nickname for her father. Searching for baptismal records for her siblings may reveal not only her father’s full name but her mother’s as well, and possibly more. 40 acres of farmland were transferred for free to your ancestor Jacob Davies by someone named Douglas Jones. That may indicate a very generous and unrelated benefactor, but it could mean Douglas is Jacob’s father-in-law, a critical clue to discovering his wife’s maiden name. You’re trying to find your ancestor James Wilson on the 1880 census. The problem is, there are way too many James Wilsons out there to know which is the right one. But suppose you know that in 1870 James’ brother Ephraim lived on one side of him, and someone named Sigmund Krantz lived on the other. Searching on these much more unique names can make tracking James down in 1880 a piece of cake. There are thousands of examples of just this sort of revealing information being discovered that you will never find if you limit yourself to just your ancestors. But until you start putting together a FAN club and searching those collateral records, you never know what you might find. We can often find when our ancestors were born and died, but filling in all the years in between is vital to telling the whole story. Your FAN club can help. All of these events involve a family member, associate, or neighbor, in most cases several. Not only do these events flesh out your ancestor’s life story, but following prominent members of the community who were associated with your ancestor at one point can lead you to other documents you’ll never find otherwise. Also, the better your timeline is in terms of where your ancestors lived when, the easier it is to know where to find the records you need to extend your research. Be sure to focus on family members, too. Knowing where and when each of their children were born helps connect your ancestors to specific times and places as well. For example, you may find that your ancestor was a sponsor of their nephew’s baptism during a time where there’s a gap in their timeline. Wherever that baptism took place could be evidence of your ancestor’s location at the time of that event. And the only way you could have discovered this information was to find and analyze the baptism record of an extended family member. There are some unique names out there, but fewer than you might expect. And there are thousands upon thousands of John Smiths out there. The bad news is that it can be incredibly tough to find the right John Smith. The good news is every single one of those individuals has a separate FAN club. Find the family, associates, and neighbors that are connected to your John Smith, and it will be much easier to find the sources you need to expand your research. So now that you know the importance of FAN clubs, how do you actually go about building them? Where do you find all of those family members, associates, and neighbors? The answer is: everywhere. Any record that you can use for genealogical research can be used to build your FAN clubs, too. Family records are the ones most familiar to genealogists. Extract everything you can about your ancestor, but pull out details on his or her family members, too. Baptism records reveal parents names and sponsors. A family Bible can be an incredible help, even if it only lists names. Cemeteries – families are often buried near one another, and near in-laws as well. Always contact the cemetery and ask who purchased your ancestor’s plot (and when) and if that same person also purchased other plots. This could lead you to completely unknown extended family members. Marriage records often list parents, and other relatives may serve as witnesses. Death certificates may list parents, siblings, children or even neighbors as the informant of personal information. They also give you the place of burial which can then lead to other findings by using cemetery records. Obituaries often list many family members across two or three generations, including both maiden and married names for women, and sometimes place of residence as well. Probate records and wills are a terriic source for spouses and children, and often siblings, nieces, nephews, and grandchildren as well. Land records, including inherited land and land divisions. We all build groups of associates throughout our lives, through school, work, social activities, and more. There are as many sources to identify associates as there are ways to make them. Don’t forget to check the front page, too, for that article about your great-grandmother saving a young girl from drowning! You can also find associates listed as witnesses on marriage and death certificates, naturalizations, as baptism sponsors, godparents, and more. The two main sources of identifying neighbors are city directories and census records. Ancestry has a terrific collection of city directories as well as every census currently available to the public. You can access them with a free trial here. Both of these resources can be helpful in finding your ancestors by letting you search on nearby people as well. When checking census listings and directories, be sure to look beyond just the house on either side. Skim through several nearby households to look for familiar names that pop out. For a census, for example, check not only the entire page where you found your ancestor, but at least one page before and after as well. Ship manifests may provide information at both ends of the journey. They can help identify possible neighbors from before your ancestors left the old country, as well as possible family members and associates after they reach their destination. The recent explosion of DNA testing in genealogy and family history research can be a great help in finding modern family members. Autosomal DNA tests connect you with your recent ancestors, those from the last five or six generations. That means they also connect you with all of the other descendants of those ancestors, too. You can use DNA matching to find living cousins that you never knew existed. In some cases, DNA testing can connect you with specific well-known and well-researched ancestors as well, rapidly expanding your family tree. See my guide to DNA testing here. Our focus is always on our direct ancestors, but don’t let that focus get too narrow. Take some time to build FAN clubs for your ancestors, too. The more you know about their family, associates, and neighbors, the more you will learn about your ancestors themselves, and the better chance you will have of finding otherwise hidden records. So the next time to hit a brick wall, try starting a FAN club!